Beauty and Elegance 114 West 81st Street, Apartment 1 A rare jewel--this gracious full floor parlor-level coop apartment in a restored c. 1892 brownstone offers two bedrooms, dining area, chef's kitchen and a well-designed separate home office/convertible 3rd bedroom. Tastefully renovated with wonderful period details that include beautiful moldings and 10'9" ceilings in every room. Stunning and serene master bedroom with a decorative fireplace and lovely light through over-sized bay windows with garden views. 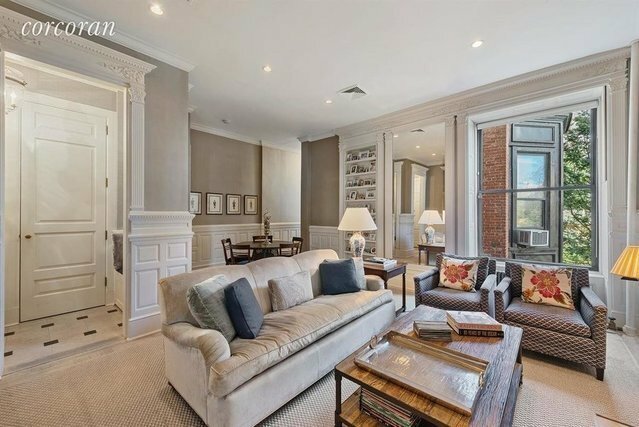 Spacious 2nd bedroom features three large bay windows with historic brownstone views. Modern chef's kitchen with center marble-top island with seating, custom cabinets with glass doors and lighting, Sub-zero refrigerator with separate freezer drawers Miele dishwasher. Marble bathroom with separate bathtub and shower stall. Powder room that can be expanded into a full 2nd bath. Washer/dryer. Pied-a-terre friendly. Dogs are not permitted.Located next to Margaret Mead Green adjacent to the American Museum of Natural History and one block from Central Park, this 10-unit brownstone cooperative has a part-time superintendent and easy access to restaurants, shopping, public transportation, and all the Upper West Side has to offer.